Dakup is working on his Ph.D. in pharmaceutical sciences. He is from Pankshin, a city in Plateau State, Nigeria, and completed his bachelor’s degree in chemistry from Columbia College in Missouri. He first came to WSU in 2014 to participate in the college’s Summer Undergraduate Research Fellowship program. The “togetherness” of the faculty and students at WSU and supportive values held by the CPPS influenced him to pursue his Ph.D. here, which he began in the fall of 2015. “This research started out as my side project. I was interested in investigating how the mechanisms of our biological clocks can be modulated naturally to reduce heart-related toxicity caused by radiation treatment,” Dakup said. Research at the WSU CPPS supports the university’s land-grant mission to address some of society’s most complex issues, specifically WSU’s efforts surrounding developing practical solutions to challenging problems in health care delivery, health care access and disease prevention. The American Heart Association is the largest nonprofit organization in the country dedicated to fighting heart disease and stroke. 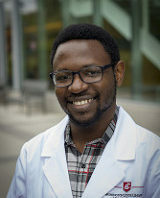 According to the AHA, its Pre-doctoral Fellowship program aims to promote integrated research and clinical training of promising students who intend to pursue careers as scientists, physician-scientists or other clinician-scientists, or related careers aimed at improving global cardiovascular health.